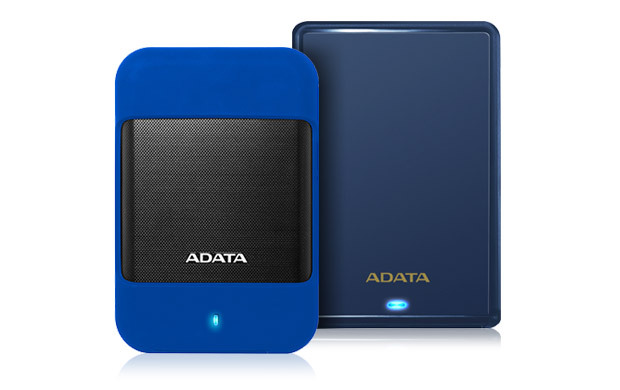 ADATA today launched the HD700 and HV620S external hard drives. The two products provide reliable and affordable storage for wide range of users. The HD700 is an entry-level ruggedized, durable hard drive with IP56 water and dust proofing plus military-grade shock resistance. The HV620S is slimmed-down version of the best-selling ADATA HV620, with a sleek glossy exterior and a profile of just 11.5mm. Both drives feature a G-Shock sensor and 256-bit AES data encryption, and are Windows and Mac OS compatible. The HD700 has been designed for users that enjoy activities such as hiking, mountaineering, kayaking, and cycling. In other words, lifestyles that call for storage to capture experiences as they happen while putting demands on storage devices, namely shocks, vibration, as well as exposure to dust and water. The HD700 is IEC IP56-certified, meaning it offers dust proofing against all but the finest particles. The HD700 is also water-proof, able to withstand high pressure jets of water. It meets MIL-STD-810G 516.6 drop test requirements to ensure military-grade impact proofing. The HD700 uses multi-layered protection, with a cushioned interior, hardened plastic enclosure, and a removable shock-canceling silicone cover. The HD710 is available in 1TB and 2TB and uses USB 3.0. Its removable silicone covers will be made available in multiple colors, to be announced at a later time.